Between all the crazy weather we've been having from what is referred to as the Polar Vortex, and writing a proposal for a Christmas novella, I've been thinking about snow and how people in bygone days got around. This photo of a City of Toronto street car is from the Toronto Public Library and is inscribed, T.T.C. Sleigh #2 going to pieces at Frederick garage May. 1954. It's the only street car I've ever seen with runners so I'm not sure if it was a common occurrence, and it looks new as if it hasn't seen much use. That's fine for the city folk, but what about the rural areas? 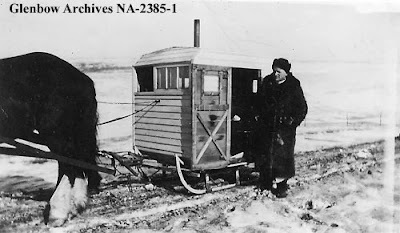 Out on the Canadian prairies, people used an assortment of home-built enclosed people movers - often called a caboose - to get across the deep winter snow. 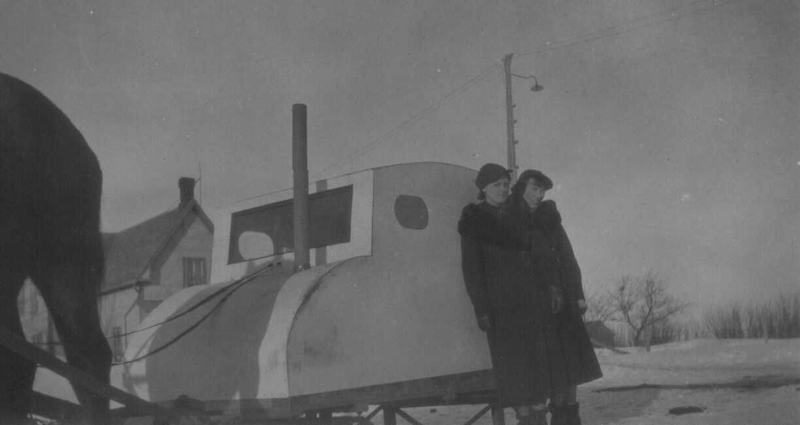 This next batch of images is from the Lanigan area of Saskatchewan and courtesy of the Lanigan and District Heritage Assoc Virtual Museum which shows the ingenuity and variety of these winter vehicles. The site also includes first-hand reminisces of what it was like to ride in one of these winter conveyances. The information included with this first photo says it looks like an old car, and I suspect it's made out of wood - especially if you look at the wooden door. These next 2 images are the cabooses used during 1930-1950, often with barrel or pot-bellied stoves and a smoke stack to provide needed warmth while transporting children to school - their most common use. 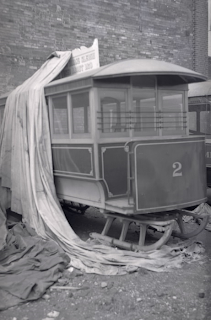 Herb Siegel built this caboose and it was used extensively in the cold, snowy months as the family's transportation. The horses and cabooses would be able to cross country, saving many miles. They were equipped with a little wood stove and lots of blankets. 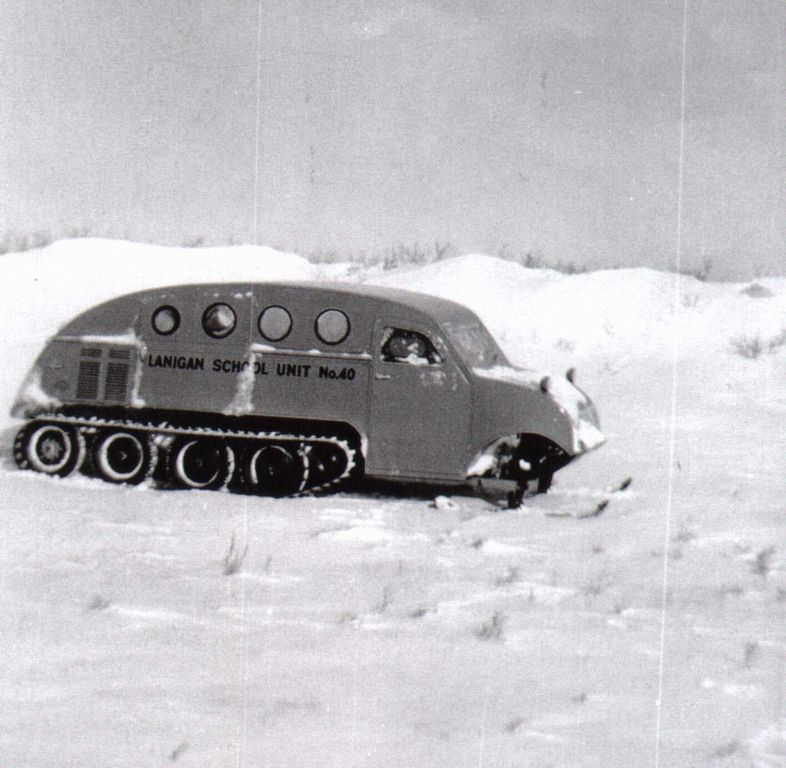 This next image from the Lanigan area shows an old car body with makeshift top. It would have kept the snow off you, but I don't see a smoke stack, so it would have been terribly cold for travelling. ca. 1950-60 Lanigan School Unit No. 40. Courtesy of the Lanigan School Divistion, and the Lanigan and District Heritage Assoc. These next 3 images are from the Glenbow Archives which although based in Calgary, Alberta, is a fantastic online resource if you're looking for public domain images. First up is a home-made outfit called a 'Go-devil sleigh'. It's a heavy wooden sledge body and an old car top cover, and from this photo it seems to be sitting on wheels on the railroad track. Intriguing. ca. 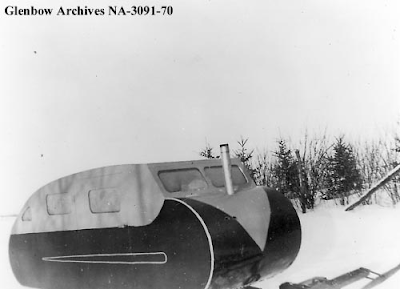 1930 Go-devil sleigh, Dorothy area, Alberta. Glenbow Archives. 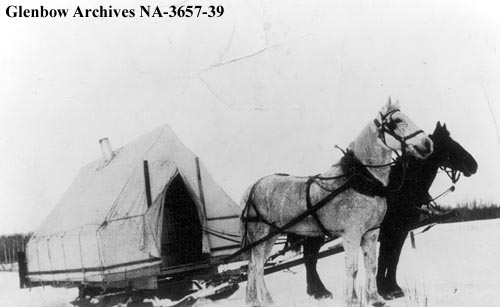 This next image is from the Peace River District of Alberta and uses a canvas tent for shelter along with a stove for warmth on a wooden runner base. 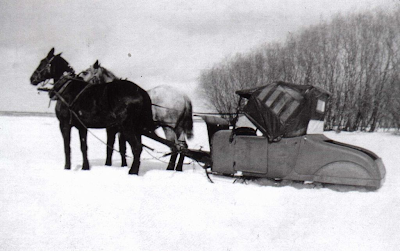 January 1938, Alphonse Plante's covered sleigh, entering the Peace River area, Alberta. Glenbow Archives. Designed and made by Polish farmer, A. T. Stocki. Sold in his district originally at a cost of $10, then $25, then in 1940s for $100 each. ca. 1928 by A.T. Stocki, Caboose on sleigh, Tarnopol, Saskatchewan. Glenbow Archives. Finally, if you ever wondered how the old circuit riders got around during the winter, here's the method of choice for Father Thomas A. Ash who used a heated wooden caboose atop a sledge to make his winter parish visits. 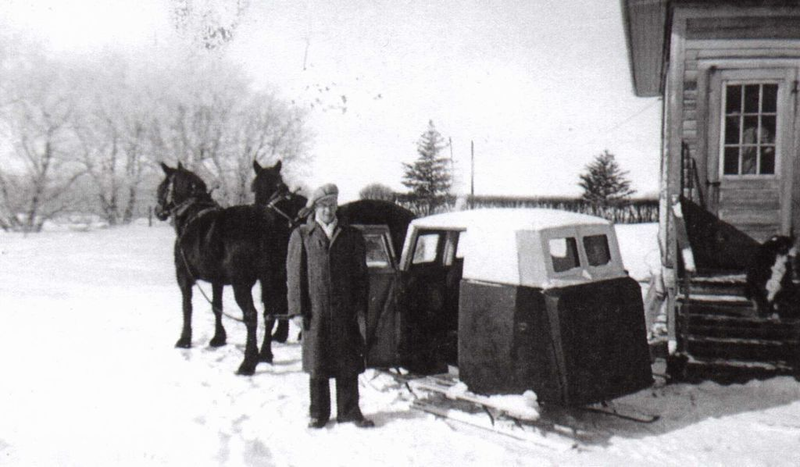 undated Father Thomas J. Ash near Meacham, Saskatchewan. 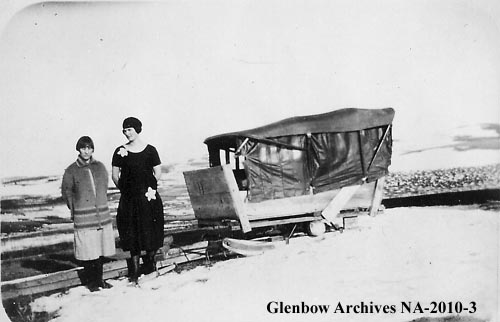 Glenbow Archives. I hope you've enjoyed this trip across the cold, snow-covered prairies. Which caboose appeals to you? This first pic is what I see every time I enter Regina on Hwy 1E however, I took this photo at the full zoom length of my Nikon CoolPix P500 camera, and then cropped it to about 1/20 the size of the original to get this view. That's a looooooooooong way off. Even then, I couldn't make out the name on the trailer and so it took me about an hour to track down the manufacturer - a feat I only accomplished when I zoomed down with Google Earth and the name Balzer flashed across the GE screen for an iota. A quick call to Balzer's in Regina and I finally have the following info. Although Balzer's in Regina sell these modern snow cabooses called SnoBears, I had to go to the SnoBear Canada site to see what they were all about. It's a nice site, but the images leave a lot to be desired, so I downloaded the pdf files. While waiting on those, I did a google search and ended up on the SnoBear American site which has much better images and includes videos. Made for the ice fishing crowd, at around 50K, the SnoBear is an expensive toy, but they have a second model called a SnoGrizz which is an excellent people mover in the winter recreation, or other industries which exist in hard-to-get places. Not only that, but the heated SnoGrizz can be as a winter ambulance as it has room for all the needed equipment as well as the attendant. Of all the videos I watched, I like this one the best as Bob Izumi of Bob's Real Fishing Show is introduced to this fabulous little snow machine. The first 50 seconds are great, and then after a minute of Bob's show theme, it shows another minute or so of SnoBear features before getting down to the ice fishing. One thing I wanted to note about the SnoBear is that when you find your ice fishing spot, the SnoBear drops down close to surface level. I wonder... has anyone tried skiijoring behind a SnoBear? I like the last one the best. Cute! This was a great reminder of how difficult it was to get around in the type of weather you have, Anita. Of course I worry about the horses while they had to stand and wait. At least pulling kept them warm. I'm very happy to have a truck with heat (modern day caboose) and I don't feel guilty for leaving it out in the weather. The last one reminds me of the little buildings some people put up at the end of driveways to keep their kids out of the elements while they wait for the school bus. I've seen them most in the rural areas of Thunder Bay. Unfortunately, most of the roads I've seen them beside have had too much traffic and no shoulders to pull over on to take a pic. It's on my blog idea list to write a post with pics about those little and very unique buildings. The last one is really cute to me, too. I've read about these cabooses before, but never seen pictures. I've always been curious what they looked like. 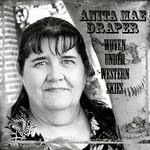 Thanks for the pictures and post. You're welcome, Susie. I suppose they were used in the US as well, but I used images from my favorite on-line resources. Oh, Anita, this is priceless. I love it. I think the bombardier is my favorite. Well Suzie, Bombardier is the most well-known. I had a chance to travel in a Bombardier back in the early 80's when I visited the Columbia Ice Field in the Rockies, but it was too expensive for our meager budget. 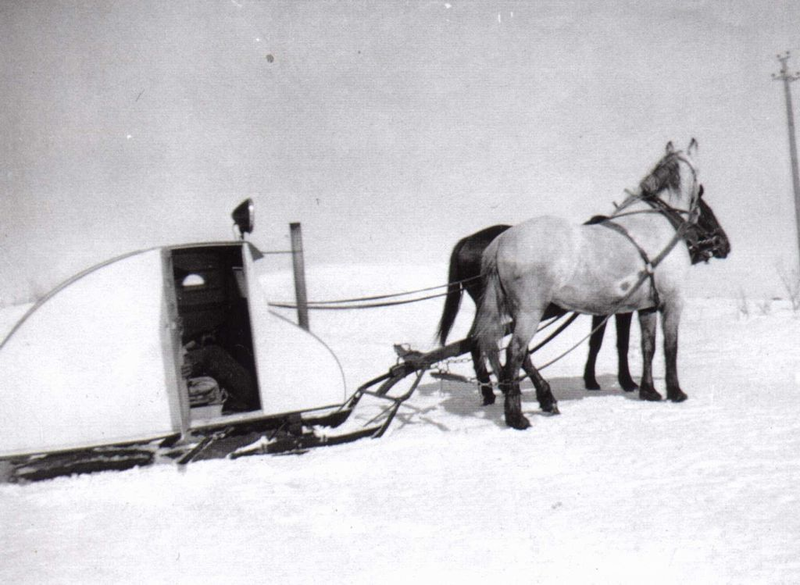 We were touring with our pop-up tent trailer and I remember just the camping fees at the ice field were steep. Also, that was before the behemoth people movers that they now use came on the scene. My Dad has talked about these cabooses. I too have seen a few on the side of the road for school children in my area. How cool these are! My favorite is the next to last one that looks like a cross between a spaceship and one of the old "canned ham" campers. Thanks for sharing! LOL Niki, good description. 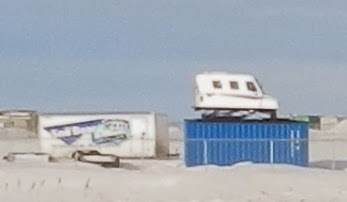 It reminds me of a camper, too. I just love your picture posts. I am ever in awe of how you acquire information and photos of such interesting information. I think I like Father Tom's little cabin best - although the mobile tent is one to consider as well. Hey DebH, thank you. I appreciate you saying it. Can you believe that people lived in those tents all winter long during the early days of settlement? You'd find a brick house on a city lot beside a plank house right next door to a tent. Crazy. But what's crazier is that trappers lived in tents like that out on their trap lines, too. Brrrr. I have never seen pictures of these or even heard of them. How ingenious they were. Thank you for sharing these. And thank you for stopping by for a visit - oh, and you just reminded me that I haven't added these to my Pinterest board yet. I'll have to get on that tomorrow.